A good decision is one that solves the problem and to do this we need, as managers, to be open to ideas and suggestions from our team. However, the way in which we phrase our own suggestions can negatively influence our reaction to ideas and suggestions from others . 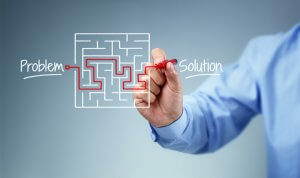 Objective problem solving should be at the heart of good decision making. Yet we often imply our personal preference by saying: “I think option A is the right one”. When we do this we are far more likely to have an emotional reaction when others disagree with our decision or idea. This happens because the other person’s disagreement implies that we are wrong and so this feels like a challenge to our position, authority and status. If instead we say “Option A solves the problem”, then we are more likely to be open when someone else in our team disagrees with us. In this case the other person’s disagreement is not perceived by us as an attack on our ability, rather we are more likely to view it as a joint effort in arriving at the best possible solution to the problem. Being open to others ideas brings different, complementary strengths to the table. Managers typically focus on the strategic view, and seek to solutions to guide the company and their team successfully forward into the future. Employees, on the other hand, tend to have a pragmatic understanding of the day-to-day workings of the company and so often have ideas on the best and most efficient way to get these daily tasks done. Think of the decision you need to make as a problem to be solved. Communicate to others what this problem is and how your proposed solution achieves this. Do stay open to alternative solutions or changes to your solution that your team suggest to you – remember they may be closer to the “sharp” end of the business than you are and will know the best way to get the work done as well as what their colleagues think. If you have fears or concerns about your own manager’s decision then frame these as a request for more information. Your ideas are important to the company’s success so be prepared to put forward any suggestions you have to your own manager. You will need to build a solid business case to show that your idea is the best one. Describe clearly how your solution moves the company forward into the future.